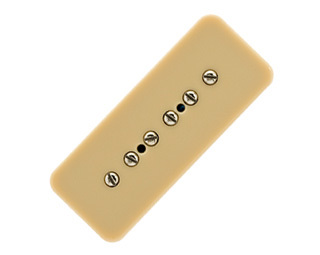 Based on pickups from Sean Costello's '53 Goldtop that he sent to Jason Lollar to copy, these soapbar P-90s are coupled with weak magnets to produce lower output, a delicate attack, and less midrange and bass. This produces a brighter overall tone with less grinding distortion. It's also slower to overdrive an amp as compared with stock P-90s. An excellent choice for players seeking an early Freddie King style tone. Includes de-gaussed Alnico 2 magnets. Available in black, cream, or white. I bought these for my Les Paul Deluxe. I had been listening to too much Joey Landreth and Jedd Hughes. Really wanted that 50's vibe Les Paul thing. These were exactly for what I was hoping for... The bridge is real bighty without being harsh. 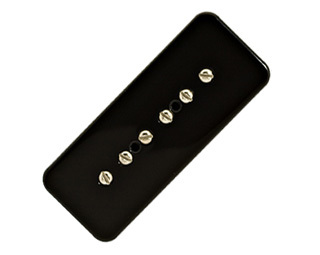 The neck is buttery and has that big fat single coil kinda quality. The middle position has a lot of clarity and an almost Zeppy kinda quality to it. Would highly recommend for anyone wanting that old school Les Paul tone! I put this pickup in the neck position of a 1958 Esquire. The tone is subtle, warm and precise. It sounds like a P-90 from the mid 50's with ALL of the good qualities those pickups have. It responds perfectly to boost, comp and various delays and reverbs. Great pickup! I bought a prs se 245 with p-90s from musicians friend several months ago for the most part I was happy with the guitar except for the neck pickup which I found dark and out of balance tone wise with the bridge pickup after speaking with Jason he recommended the 50s wind neck .Not only did this pickup brighten up the neck but the guitar is so much more balanced now and the tone is so sweet thank you Lollar Pickups.